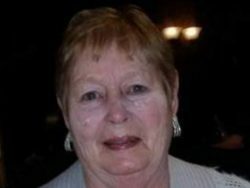 Sue Checkley - Heritage Funeral Homes Inc.
of Arthur passed away peacefully at home surrounded by her family on Friday, February 1, 2019 in her 77th year. Beloved wife of the late Leslie Checkley (2013). Cherished mother of the late Shawn “Chuck” Checkley (2018), Shannon “Ab” and Brad Hickman and Christofer “Boys” and Adrienne Checkley (Schmidt) all of Arthur. Grandmother “Easel” of Josh “My Boy”, Abby “Moosie” and Jake “Boo Boo”. Sister-in-law of Ruth Louttit, Lil Henry (Dave), Betty Richardson, Brenda Fair (Ken), Mary Martin (Jim), Bill Checkley (Lorna) and Kate Checkley (John). Fondly remembered by her nieces, nephews and friends. Predeceased by her parents Perc and Enid (Vick) Felker, father-in-law and mother-in-law Wilbert and Jean Checkley and brothers-in-law Garnet Louttit, George Henry and Blaine Richardson. To honour Sue’s wishes cremation has taken place followed by a private family service. As expressions of sympathy donations to Groves Memorial Hospital would be appreciated by the family.